وجه العملة Effigy of Queen Elizabeth II and the words "Elizabeth II DG Reg Fid Def 2 Pounds"
1oz 2018 Britannia Silver Coin We’ll treat you to the lowest price online when you order your 1 oz 2018 Britannia silver coin from our store today. Britannia coins are amongst the world’s most popular bullion coins and not only do they offer a sound investment opportunity, they exemplify the precision and artistic finesse for which the British Royal Mint is renowned. 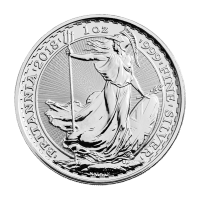 The reverse feature is the same classic design as envisioned for the 1987 edition of the coin, enduring Britannia, as she stands fast in the face of a mighty wind, a symbol of British integrity and moral fibre. Her mighty presence is further sublimated by a dazzling starburst field of radial lines and this breathtaking scene is encapsulated by a frame bearing the coin’s details, weight, purity, title and year of issue. The obverse of the coin features a new design element in the textured guilloche field which enhances the coin’s lustre, provides an extra layer of security and brings out the intricate details of Elizabeth II’s familiar relief in the fore. Also on the obverse is Elizabeth II’s regal title and the coin’s unique denominational value. Mighty Britannia is to be considered an embodiment of the tempers which make her nation strong, as she clutches symbols of sustenance, defense, peace and sovereignty. Fortify your holdings with this poignant symbol of perseverance when you order your 1 oz 2018 Britannia silver coin today.